[00:29:01] <jepler> anyone know if there's a real reason that hm2-stepper/7i90.ini uses keystick for its ui? [01:47:50] <jepler> seb_kuzminsky: think for a minute what it means for a .d file to be "out of date"
[01:48:20] <jepler> seb_kuzminsky: i.e., how do you know if a .d needs to be re-made? [01:55:53] <seb_kuzminsky> what am i missing? [01:56:46] <jepler> suppose x.c includes y.h. a change to y.h could newly include z.h. [02:00:00] <cradek> by adequate do you just mean you can't do any better? [02:11:51] <jepler> I think one of the runtests is effectively testing "can you build a realtime component using those headers"
[02:20:32] <jepler> I can have clang tell me about this at runtime; that's more than nothing. [12:36:15] <jthornton> DEFAULT_SPINDLE_SPEED was added 2 weeks ago and people are trying to use it already... 2.6.3 time? [14:18:26] <cradek> added how to what? [14:23:35] <jepler> seb_kuzminsky: you mentioned wanting to use a u3 to run a 3d printer .. what board(s) would you use for the heaters and analog temperature feedback? [14:29:50] <jepler> somebody should make something with a mesa-style pinout, using a micro like an AVR for the analog. [14:32:00] <jepler> oh the ever-lovable arduino footprint (mega variant)? [14:56:38] <jepler> seb_kuzminsky: do you have a 7i90 yet? [16:06:56] <memfrob> are you guys using -mfpu=vfpv4 -mfloat-abi=hard ? [16:07:30] <memfrob> i heard something about ARM floating point acting differently. [16:07:56] <memfrob> i wonder if -d16 is the problem. [16:09:38] <jepler> what problem are you investigating? [16:12:36] <CaptHindsight> "converting a negative double to an integer gives 0 on arm, in contrast to the result on x86 where you get an "as though signed" conversion"
[16:14:44] <memfrob> so its not a bug in gcc floating point / ARM VFP unit? [16:19:47] <memfrob> i thought it did. [16:27:32] <jepler> anyway, as for the u3 it looks like it architecturally supports vfpv3 without the -d16 (indicating that there are 32 double precision FP registers). I assume ubuntu configured their armhf compiler with -d16 in order to support more hardware with the same binaries. [18:40:27] <jepler> "HUMPS - HAL User Message Passing System"
[18:42:05] <skunkworks> what is a sivar 7m43? [18:42:30] <skunkworks> google failed me..
[18:42:52] <skunkworks> I don't like it. 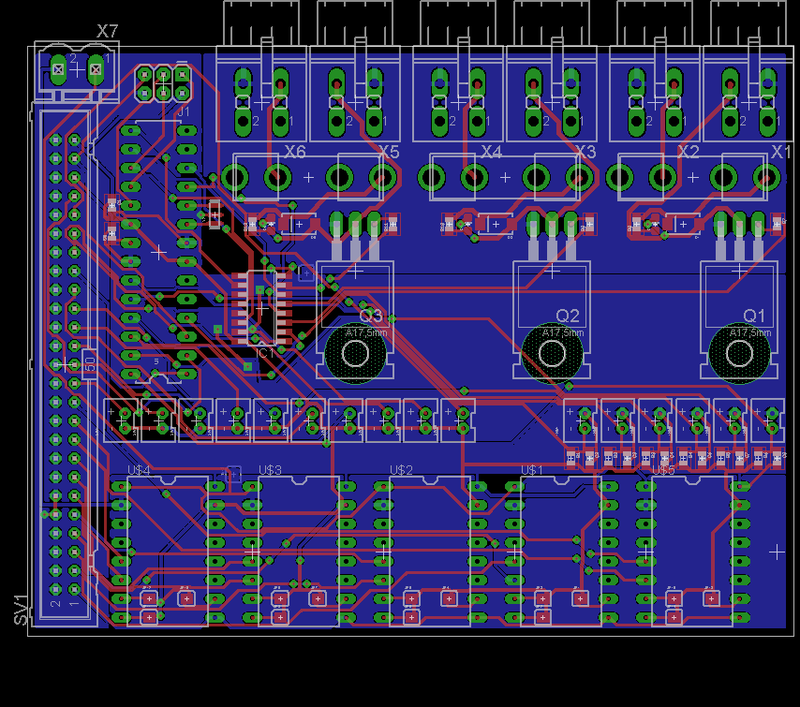 [18:44:05] <jepler> but it makes me want more than ever a hostmot2 card with an Open Hardware board design. [19:17:13] <seb_kuzminsky> they make screen printing machines maybe? [19:18:36] <seb_kuzminsky> to the git repo? [19:24:24] <seb_kuzminsky> what's the difference between 5i24-16 and -25? [19:25:28] <seb_kuzminsky> is that 2.5 Mgates? [19:27:47] <pcw_home> I find the the -9 Spartan6 parts (like on 5I25) are about like the old Spartan3 400K so multiply the new size by 40 and its ~= "gates"
[19:33:49] <ssi> the artix line is much more expensive to, isn't it? [19:52:38] <CaptHindsight> pcw_home: any idea how much current the spartan6 on the 7i90 draws during startup and config? [21:44:15] <kwallace2> I looked inside minigl.c and it looks like it mostly converts GL in C to Python. Is that right? [21:46:31] <kwallace2> jepler, Yay, I actually figured something out. [21:52:10] <kwallace2> I have been chasing my tail the last few days trying to figure OpenGL out. I figured an update might be in order. Then I could learn a modern version, but it seems such a mess that it might be easier to try to deal with what is currently working. [21:56:30] <kwallace2> OpenGL ES does sound interesting since LinuxCNC doesn't really need the fancy bits of OpenGL proper. [22:11:30] <ssi> PCW: would you get adequate coupling without a ferrous core? [22:12:40] <ssi> this is just signal level stuff you want to couple, not power? [22:12:47] <ssi> like to replace an opto? [23:45:33] <skunkworks_> jepler: have you had that happen more than once?